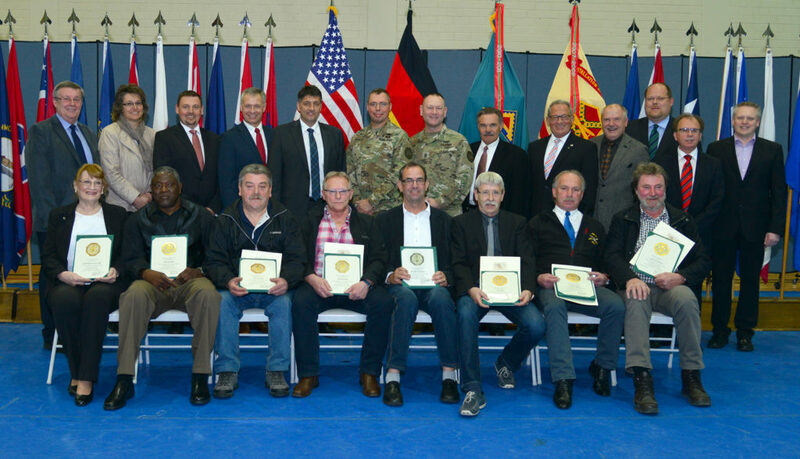 GRAFENWOEHR, Germany — Sixty German and American civilian employees were honored for 20, 25, 30, 35 and 40 years of service to the U.S. Army in a ceremony here April 15. In opening remarks, garrison commander Col. Mark Colbrook highlighted the importance of the civilian workforce in supporting the Soldiers who work and train in the U.S. Army Garrison Bavaria footprint. “I can’t stress enough what the years of combined experience in this room means in terms of being able to support Soldiers, families, the mission of the U.S. Army, and the larger mission of NATO and our allies,” Colbrook said. In addition to the length of service awards, Colbrook presented an award for excellence in customer service. Several local mayors were also in attendance to honor the employees’ dedicated service. These include Edgar Knobloch of Grafenwoehr, Juergen Kuerzinger of Kirchenthumbach, Carmen Pepiuk of Trabitz, Peter Lehr of Eschenbach, Werner Walvberer of Pressath, Hans Koch of Koenigstein, Markus Ludwig of Stoernstein, Thorsten Hallmann of Schwarzenbach, and Thorsten Grädler of Vilseck. To view photos of individual awardees, visit our Civilian Award Ceremony April 2016 Flickr album.